Summer's been busy thus far and it'll probably continue like that until September. First, I'd like to thank everyone who have said nice words about my junk, haha. Your support is appreciated. And for those who wonder if I'm ever going to create other Dragon Age stuff... I have a hate/love relationship with the game. I take long breaks from it and when I rediscover it, I start obsessing again. Well, I've been playing it lately (at nights mostly) and I'm loving it once again. I wanted her to look tough, but also elf-ish. On one hand, she never smiles, wears her hair in two tightly braided buns, has intricate tattoos all over her face, yet her slanted eyes and low eyebrows balance the other, stricter features. 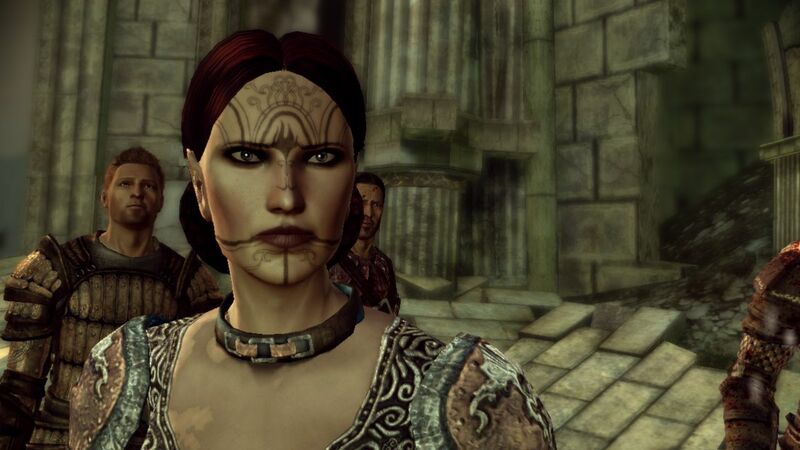 She was a Dalish elf through and through, trusted only those humans she traveled with and supported the mages (saw their situation as similar to the Dalish). She respected Morrigan and Wynne became like a surrogate mother for her. She's my first mage in DAO (huh) and I just finished the Korcari Wilds with her. I haven't fleshed out her character yet, but so far she's been like a wide-eyed child who sees the world for the first time. Which she kind of is, actually, like many Circle mages. I think she will mature and become more wary during the game, maybe even losing friends and faith in their cause after making some bad choices. And her tattoos look like wings, representing the freedom that she thought she'd never see. 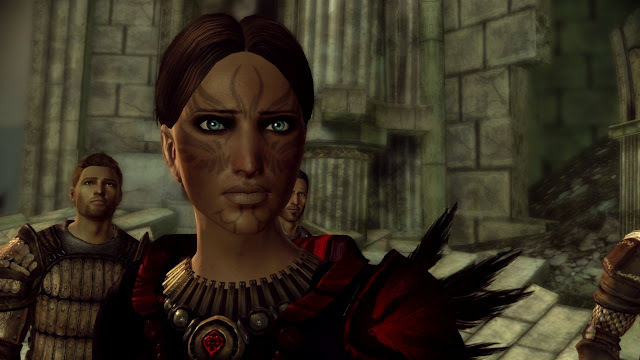 Anyway, the point is that I'm kinda obsessed with Dragon Age again, but I haven't forgotten about Sims either. I have some ideas, now I'll just have to wait until September when I have perhaps a little more time and access to my PC. 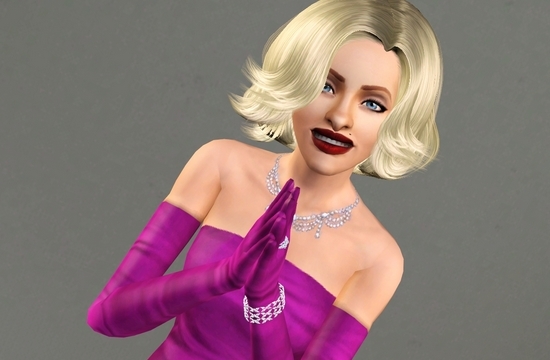 I know some people have wondered how to take good pictures of your simmies in TS3. There are some rather easy techniques and simple truths that I'm going to share in this tutorial. Note: My graphics settings are all set on highest. If you have a weaker video card, just turn the settings as high as possible (Sim Detail and Lighting and Shadows are the most important ones, also Edge Smoothing if you want... well, smoother edges). It's temporary, so if your game starts lagging, don't let it bother you. So you have created a beautiful and unique sim that looks great in CAS but you're unable capture that beauty in-game? It isn't possible to make the sim look exactly the same in-game, but you can improve the looks by using the following tips. First we're going to need a closed room. 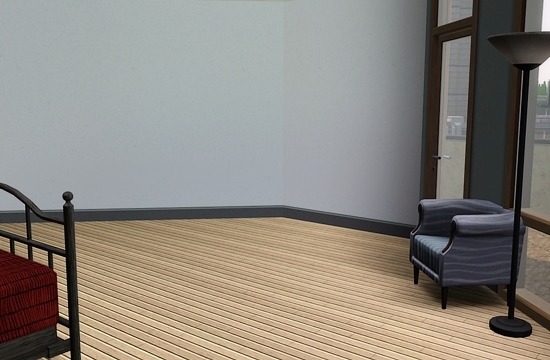 Your sim probably lives in a house or an apartment, so that won't be a problem. My sim Madeleine lives in a nice apartment that has a perfect straight and plain wall for taking pictures. Notice how the walls are light grey? If you're taking pictures of your sims, it's best to keep the background as plain as possible, as it directs the focus on the sim and creates no unnecessary distraction. TIP #1: if you don't have a plain wall or if there's some furniture blocking it, just use CAST to temporarily repaint the wall and move the furniture away. It costs no money and you can change it back later. When I'm taking pictures, I usually use the moveobjects on cheat and I also temporarily turn off free will, so my sims will stay put instead of moving around and ruining the picture. So move your sim in front of the wall, facing the camera. 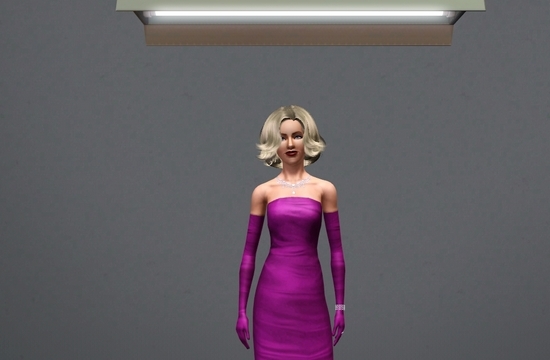 Now we're going to take advantage of the great lighting system of TS3 to improve the picture. Have you ever noticed that you can change the intensity and colour of the lamps? This will play an important role in the next part. There are three types of lamps to use: wall, ceiling and floor lamps. 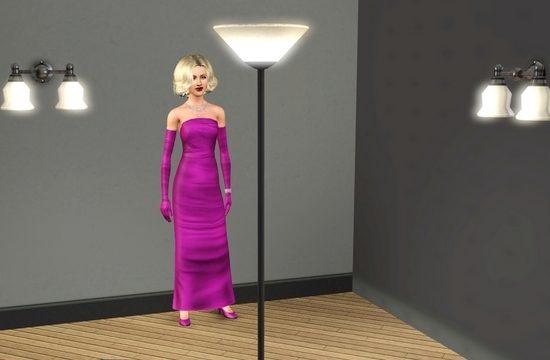 Wall lamps are great when you want to add light to sim's back, making the shadows more subtle. Ceiling lamps are great when you want to have dramatic lighting that highlights the forehead and cheekbones. Floor lamps are best for taking pictures, since they give light directly to the face and don't create weird shadows. You can also move them freely around. TIP #2: If some lamps are too bright or some too dim, try changing the intensity (just click on the lamp to open the menu). Also, change the colour of your lamps to white or flame - it gives the most natural results. Now it's time to take pictures. I think the Tab-view is very useful for taking better pictures. Move the camera in front of your sim and click tab. Scroll up and down to zoom in or out. You can also click shift+d or shift+a while in tab-mode to rotate the angle, it's a quite cool feature. TIP #3: If the thought-bubbles or plumbobs are blocking the view, simply enter the cheat code hideheadlineeffects on to hide them. To turn the cheat off, enter hideheadlineeffects off. Now, if you're wondering how to get sims to pose... well, there isn't a certain way to make them pose. Each sim has some autonomous animations, depending on their traits and moodlets, that they do at random times. For example, hopeless romantics sigh romantically, perceptive sims take out a magnifying glass, etc. It's up to you to put these animations to use and try to capture some interesting moments. It's also possible to have your sim do something unrelated (i.e dance, throw darts, gussy up or whatever) and then move them with moveobjects_on to your "studio" and take pictures. In case you're wondering, I never do any post-editing on these pictures, except for resizing and sharpening them a little. You don't even need Photoshop to do that; for example, I use PhotoFiltre for that. 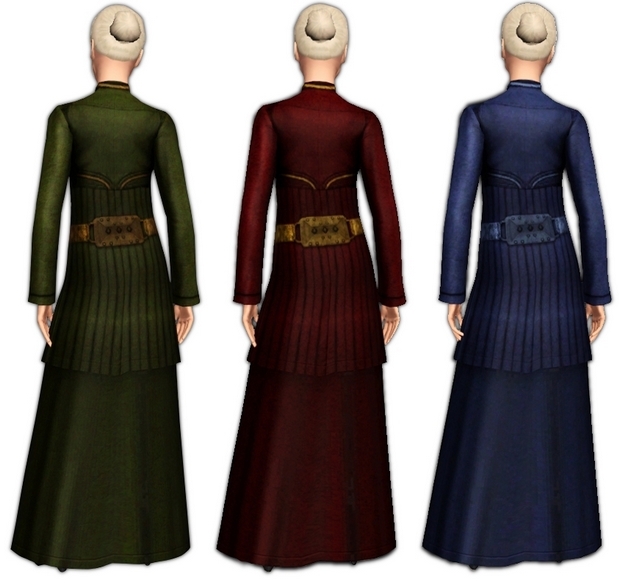 Here's my newest creation, a robe for adult and young adult female mages. Of course, since there's no real magic in TS3, it's best for storytelling and making movies. 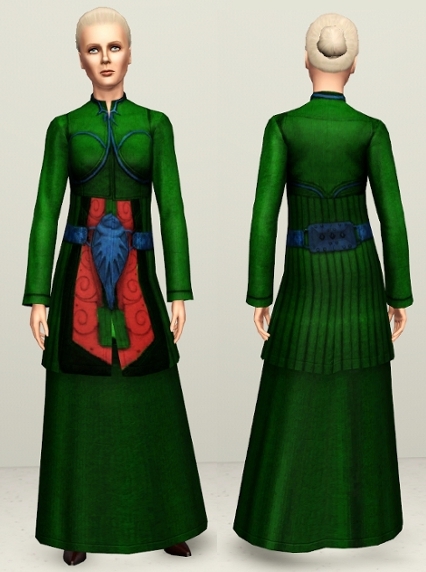 It's based on the robes from Dragon Age and originally created for my Wynne sim. It's the first time I found some real use for the outfits that came with World Adventures. 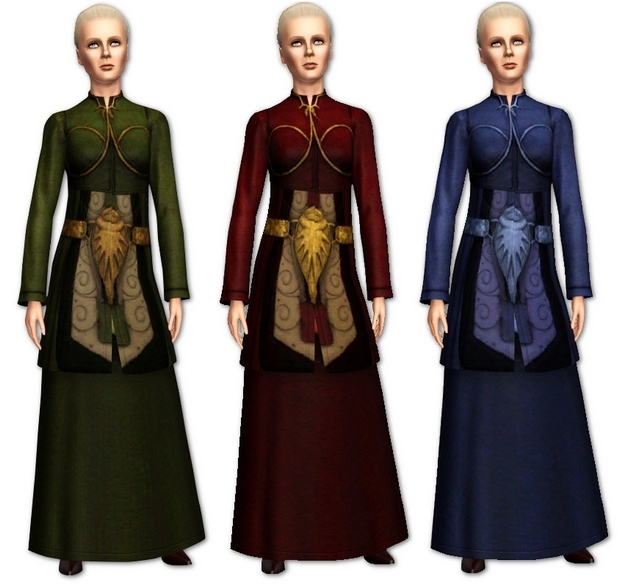 So, if you want to have this outfit in your game, you must have the World Adventures expansion pack, otherwise it won't show up.